Song Lyrics: What will the Sun look like when it dies? 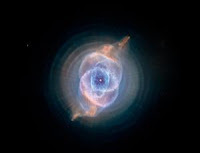 Planetary nebulae are the final butterfly-like state that heralds the end of a Sun-like star's energy-generating life. They form when stars up to eight times the mass of the Sun begin to die, bloating into red giants before shedding as much as half their mass as gas and dust nebulae. The Sun itself will begin its death throes in about 5 billion years, when it starts to swell into a red giant star. Though it's not clear exactly what its planetary nebula will look like – its shape will likely be sculpted by factors such as the Sun's future magnetic field – observations of the 1600 or so known planetary nebulae suggest our star will go out in a blaze of glory. Lasting no more than a few tens of thousands of years, planetary nebulae help seed space with heavier chemical elements that can be incorporated into the next generation of stars. A new book called Galaxy: Exploring the Milky Way by Stuart Clark features some absolutely spectacular images of these nebulae.